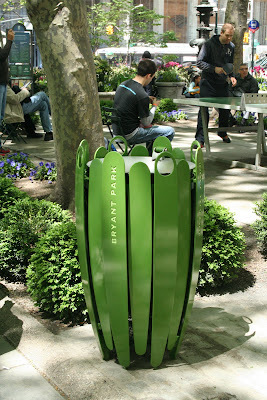 In December we asked you to help us choose a new design and color for Bryant Park's litter receptacles. We received over 2,700 votes in our poll and many insightful comments about Director of Design Ignacio Ciocchini's patented receptacle prototypes, which were displayed in the park in three different colors and designs. (Click on an image to view a lager version in your browser). In addition to the results of our public poll, Ignacio considered the opinions of design professionals, colleagues, and members of city agencies when making his final decision on the perfect receptacle to complement Bryant Park. 112 brand new litter receptacles arrived at the park last week. The final product, a combination of the Plain design, Fern Green color, and light green accents for the "Bryant Park" lettering, perfectly complements the park's vegetation. It was hard to decide on just one receptacle, so Ignacio worked out a way to put all his designs to good use. By the end of June, you'll find attractive new recycling units throughout Bryant Park in Ignacio's Organic and Linear receptacle designs. 15 Organic receptacles in standard recycling blue will be available for bottles and cans, and paper recycling will be designated to 8 standard green Linear receptacles. If you spend more time in the 34th Street area than Bryant Park, you'll still get to take advantage of shiny new litter receptacles. Herald and Greeley Square Parks, which are maintained by our sister company, the 34th Street Partnership, will boast Grass Green Organic receptacles, as well as Organic and Linear recycling units by the end of June.